One of the most historical properties in the Macarthur area, “Denfield House”, has hit the market with price expectations of over $1.2m. Built circa 1837 the property, located on Appin Road, St Helens Park, is a fine example of a Georgian farmhouse with a symmetrical façade typical of the era. 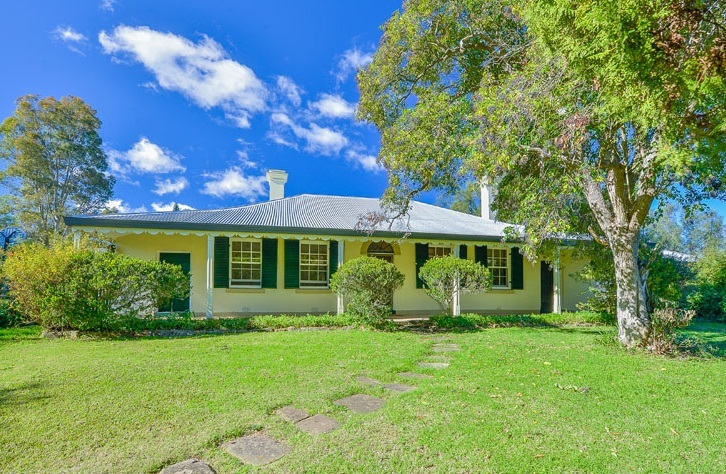 “This home has been restored over time to present a now wonderful family home whilst maintaining its original colonial charm. “The property spreads across two separate titles and sits on more than 2.5 acres of land, with the potential to subdivide one acre subject to council approval,” Tim Doyle, selling principal of Ray White Macarthur Group said. Featuring four bedrooms plus study and three bathrooms, Mr Doyle says the home offers the space that growing families need. “The property comes complete with an inground pool, cricket net, fruit trees and veggie patch. Inside, the home is heated by an open fireplace and features a variety of different living areas offering space and privacy,” Mr Doyle explains. Denfield House was originally built and owned by John Farley – the first man who claimed to have first seen the ghost of Fred Fisher. “Denfield House was built by John Farley, a respected farmer of the area. As the tale goes, after the mysterious disappearance of another local farmer, Fred Fisher, in 1826 John Farley claimed he had seen the ghost of Fred Fisher sitting on the rail of a bridge over a creek. He claimed the ghost pointed to a paddock down the creek then faded away. “The body of Fred Fisher was later discovered in the same paddock where this ghost had supposedly pointed,” Mr Doyle said. Additional features of the property includes three street frontages, water tanks that hold 32,000 litres, a wine cellar and air-conditioning for the warmer months. Denfield House will be auctioned onsite on 26 July 2014.